Published: Feb. 21, 2014 at 06:28 p.m. 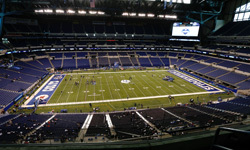 Updated: Feb. 21, 2014 at 10:43 p.m.
INDIANAPOLIS -- Day two of the combine featured 20 more coaches and general managers hitting the podium to give their state of the team addresses. Our heads were spinning even before the report surfaced that the Browns had made a run at Jim Harbaugh. Two 49ers sources denied any reports of Harbaugh trade talk to NFL Media Insider Ian Rapoport. 1. It's not completely stunning that Harbaugh's contract situation has bubbled over into controversy. Yes, Harbaugh joining the Browns would have been a whopper. But the issues related to Harbaugh's contract situation have been brewing for a while. 2. Baalke made it clear that the 49ers aren't going to ask running back Frank Gore to take a pay cut. The team is not considering releasing him. They also will not consider trading backup running back LaMichael James. 3. Any speculation that Wes Welker might be a salary-cap casualty appears to be unfounded. Coach John Fox said Thursday that it's not a "tremendous decision" because Welker is under contract. Broncos football czar John Elway reaffirmed that stance on Friday, indicating he expects Welker to be back because he's under contract. 4. Elway confirmed Eric Decker needs to "hit the market" to know his value. A re-signing sounds unlikely. "We got to look through everything, there's a lot of scenarios that we're putting together as a football team." When asked if any of those scenarios included Smith not making the team, Rivera said: "Not quite sure." 6. Rivera was more optimistic about retaining defensive end Greg Hardy. The franchise tag is an option for him. 7. The Panthers picked up 2014 and 2015 option years on linebacker Thomas Davis' contract worth $13.5 million over two seasons, NFL Media Insider Ian Rapoport reported, citing a source informed of the team's business dealings. Rapoport also reported that the Cleveland Browns' interest in Buffalo Bills safety Jairus Byrd is "real." Perhaps the Bills could place the franchise tag on Byrd, and then trade him? 8. The St. Louis Rams aren't cutting cornerback Cortland Finnegan, at least not yet. Coach Jeff Fisher indicated he expected Finnegan to be part of the team's offseason program despite his huge salary. General manager Les Snead also indicated the team would be patient evaluating Finnegan. It sounds like the team wants to see how Finnegan performs in the offseason before making a final decision on him or asking him to take a pay cut. 9. The Rams continue to support Sam Bradford as their only option at quarterback. Snead also said that running back Zac Stacy's workload is only going to increase in 2014. 11. Cincinnati coach Marvin Lewis indicated that the franchise tag was an "option" for defensive end Michael Johnson, but it didn't sound likely. 12. Lewis threw a little cold water on Giovani Bernard's fantasy owners, indicating that his workload was close to maxed out last year. 13. The more we hear about tight end Jermichael Finley, the more we think he'll be back in 2014. A return to Green Bay remains quite possible. 14. Publicly, the Colts continue to support Trent Richardson as aggressively as possible. There continue to be whispers behind the scenes about Richardson's professionalism, but the organization remains hopeful he can turn things around. 15. Then again, words spoken at these podiums have to be taken with a grain of salt. I asked Pete Carroll about Sidney Rice's future with the Seahawks, and he said he was hoping to keep Rice. Not long after that, Rapoport reiterated Rice is likely to get released. 16. Fantasy alert: Carroll talked up running back Christine Michael's breakout potential. 17. The Giants and Tom Coughlin quietly agreed on a one-year contract extension that takes them through the 2015 season. 18. In smokescreen news: Atlanta Falcons general manager Thomas Dimitroff talked up the possibility of trading up from the No. 6 spot in the draft. Snead, meanwhile, talked about the Rams trading down from the No. 2 pick just like he did a few years ago. Dimitroff emphasized the need for the Falcons to improve their line play on both sides of the ball. 19. It sure sounds like Arizona Cardinals coach Bruce Arians is too impatient to draft a quarterback and wait for him. Arians has faith that Carson Palmer can play well until he's "36, 37," and Arians loves his backup Drew Stanton. 20. If the Miami Dolphins keep cornerback Brent Grimes, it probably won't be with the franchise tag. 21. A new contract for Detroit Lions defensive tackle Ndamukong Suh should be wrapped up soon, according to Lions GM Martin Mayhew. We'll be back Saturday, when the attention will partly turn to the field. Yes, there are some players here to work out in shorts.